The size of the vending machine. While vending machines vary in size depending on type and manufacturer, many vending machines are approximately 72” tall, 36” to 38” wide, and 32” to 34” inches deep. The weight of the machine. An unstocked vending machine can weigh over 500 pounds, and a fully stocked machine can weigh 750 to 800 pounds. When planning a location for the machine, make sure that the floor can support the full stocked weight of the machine. The electrical requirements of the machine. Almost all vending machines use standard 3-hole, 120v outlets.15 amp outlets are usually sufficient, but 20 amp dedicated outlets are recommended for larger machines. Physical access limitations. Find the easiest path from the delivery truck to the final location, and plan for any obstacles that will interfere with moving the vending machine. Measure the width of any doors to make sure the machine will fit through them, and notify the delivery driver of any stairs that must be used, as special moving equipment may be needed. Other miscellaneous requirements. Some machines such as coffee vending machines require their own water supply. Also, any security restrictions for vending machine maintenance and stocking personnel should be planned for. 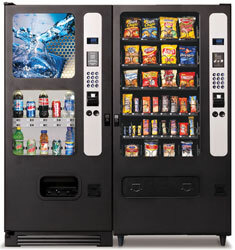 If you are considering a vending machine at your business, please call Maximum Vending at 505-980-6764. We have the specialized equipment needed to safely move your vending machines. We can also often provide you with specific sizes, weights, and electrical requirements for the machines you are considering. If your business has unique restrictions that make standard-sized vending machines difficult, we can make suggestions for alternate machines that may suit your needs.